Hi, The mechanics are doing compression check, service etc on a 35 HP Honda on a 26X. I have only seen some pictures, not complete, but told the pedestal has been removed and the wheel is now on the starboard cockpit bulkhead. For whatever reason, they said visibility, it has been done. 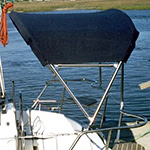 I need sun protection, so will get a bimini. Also maybe sides and back because the SF Bay gets wet. Am considering even making some kind of nice looking semi permanent enclosure as the boat is only to be used as a power boat, price might be similar to canvas. 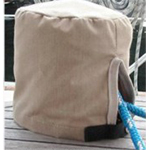 Does anyone have any experience for a dodger/bimini as a hardtop? Anyone seen the wheel moved to the bulkhead? Why not just buy a power boat? The X isn't your best option if you never plan to sail it. Yeah, what Justin said. Unless you're getting it for $1.98, there's probably better ways to go. What are your questions? Are you asking for review of your ideas? It's your money. Your thread title says you have a few questions? Question is if anyone has ever done a hardtop cockpit enclosure on a 26X? And if anyone has ever seen the wheel moved to the bulkhead position? If you don't get any answers here, you might try the 'other' 26X forum. Did you already buy it? It comes up for me. Might be a glitch. will try again, thank you, could not register, and there was earlier a window saying it was being worked on. Dottie and I are good friends with a couple that have medical issues that really prevent sailing. They bought a X and use it as a trawler. Did the 'Loop' a year or so ago and plan on doing it again. Can't find many other boats with the room inside that the X has for the money. Great boat for this kind of use if you are on a budget. Same year another X and a M also did the loop. The other two took their masts, but not many places to sail on the loop, but the other X also skipped over to the Bahamas (not just Bimini) on the loop and had been over twice before along with going from Seattle to Alaska on the water and back and the Sea of Cortez and a number of other places. Not sure how many other trailerable boats are up to trips like this. Sounds like Stuart has found a good boat for his needs. PM me if you would like to get in touch with them or find them on the other board that was posted under RIS. A 35 probably isn't going to get you up on plane if that is necessary at times. I do admire how much room they have, and I am told the layup is good quality with few complaints. You would not be the first to go trailer camping in a sailboat. Are you thinking of a soft enclosure? I would worry about anything too heavy. You could put the wheel back where it was. It should not be too hard. I am not sure how they handle in chop or seas, but it does not sound like you intend being very far offshore. Any idea why the PO has a smaller motor on a boat meant to plane? Could you move up to a 50 hp? Interesting ideas. Good luck! Andrew, A Telstar for sale fyi in Santa Rosa CA at Wind Toys. Had a 31' Kismet sailed from Canada to SF, Brown 31 and Catalac 9 M cat, raced Prindle 19s, so multis are in my blood. I have not seen the boat, waiting for the engine "survey" and if all good will get the boat. Re the 35 engine, will try it first see what it does with how many people and in what conditions. If just two of us, maybe that will be fine, I don;t need speed, getting on a plane would save fuel, but all that will be figured out with use. I am used to 6-7 knots as a good hybrid cruising speed with the Yamaha 8 and 9.9 high thrusts, so this would be a luxury speed wise. BTW, Sumner, Holy Cow, you do a lot of good stuff, thank you and congrats, will study the links for good ideas! Looks like fun. I could not find the Telstar for sale. Where is it listed? Pontoon boats make better campers. The flat floor is much more practical. But since you insist, you may look at adapting an enclosure made for a pontoon boat.